"Zwischen Ambivalenz und Ordnung: Die Politik der Menschenrechte"
The speakers at the conference were Rainer Forst, Christoph Menke, Charles Beitz, John Tasioulas, Abdullahi Ahmes An-Na’im, Jürgen Habermas, Susanne Baer, Hans Joas, Seyla Benhabib, Étienne Balibar, and Costas Douzinas. See my previous posts here and here. Amartya Sen & David Held discuss "The Idea of Justice"
Amartya Sen and David Held will discuss Sen's new book, The Idea of Justice (Harvard University Press, 2009). The event is free but a ticket is required. More information here. David Held is Professor of Political Science at LSE. Amartya Sen is Lamont University Professor at Harvard University and an honorary fellow of LSE. He won the Nobel Prize in Economics in 1998. This book offers a comprehensive evaluation of the two preeminent post-WWII political philosophers, John Rawls and Jürgen Habermas. Both men question how we can be free and autonomous under coercive law and how we might collectively use our reason to justify exercises of political power. In pluralistic modern democracies, citizens cannot be expected to agree about social norms on the basis of common allegiance to comprehensive metaphysical or religious doctrines concerning persons or society, and both philosophers thus engage fundamental questions about how a normatively binding framework for the public use of reason might be possible and justifiable. 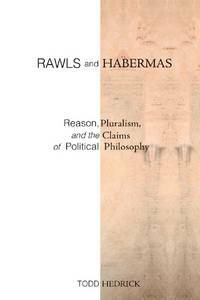 Hedrick explores the notion of reasonableness underwriting Rawls's political liberalism and the theory of communicative rationality that sustains Habermas's procedural conception of the democratic constitutional state. His book challenges the Rawlsianism prevalent in the Anglo-American world today while defending Habermas's often poorly understood theory as a superior alternative. See a preview of the chapters here. Todd Hedrick is Assistant Professor of philosophy at Michigan State University. In A Community of Europeans? a thoughtful observer of the ongoing project of European integration evaluates the state of the art about European identity and European public spheres. Thomas Risse argues that integration has had profound and long-term effects on the citizens of EU countries, most of whom now have at least a secondary "European identity" to complement their national identities. Risse also claims that we can see the gradual emergence of transnational European communities of communication. Exploring the outlines of this European identity and of the communicative spaces, Risse sheds light on some pressing questions: What do "Europe" and "the EU" mean in the various public debates? How do European identities and transnational public spheres affect policymaking in the EU? And how do they matter in discussions about enlargement, particularly Turkish accession to the EU? What will be the consequences of the growing contestation and politicization of European affairs for European democracy? Part 1: An Emerging European Identity? Part 2: An Emerging European Public Sphere? 7. A European Community of Communication? Thomas Risse is Professor of International Politics, Otto Suhr Institute for Political Science, Freie Universität Berlin. Christian Schlüter reports from Jürgen Habermas' lecture on human rights at Goethe University, Frankfurt, June 17, 2010, entitled "Menschenwürde als Quelle des moralischen Mehrwerts der Menschenrechte"
"Jürgen Habermas in Frankfurt - Missbrauch und Mehrwert"
See my previous post on the international conference on human rights in Frankfurt, June 17-18, here. Jürgen Habermas' article "On the Concept of Human Dignity and the Realist Utopia of Human Rights" will come out in Metaphilosophy later this year. "For me, Joyce, the itinerant European author, combines things in Ulysses that are otherwise seldom encountered together. He combines the artifice of a highly self-reflective, aesthetically uncompromising modern novel whose allusions are almost indecipherable with an unmistakable, though by no means uncritical, attachment to the all-pervasive ethos of his Irish native country. The novel is a declaration of love to the streets and pubs of Dublin and to the rich tradition and spirit of the country. It could be that this mixture is gaining a new resonance in times of “glocalisation”, that is especially in places where the local is entering into strange combinations with the global." (Jürgen Habermas). "Merkel has depleted her capital of trust within EU". Habermas receives the UCD Ulysses Medal at a special ceremony on June 16, 2010, at the University College Dublin. See my post here. On June 15, Habermas will give a lecture at the UCD Clinton Institute for American Studies/Global Ireland Institute in Dublin. The title is: "‘The Political’: The Rational Meaning of a Questionable Inheritance of Political Theology". J. M. Bernstein is Professor of Philosophy at The New School for Social Research, New York. His lectures on Hegel's "Phenomenology of Spirit" can be downloaded here. See my post on Axel Honneth's book here. 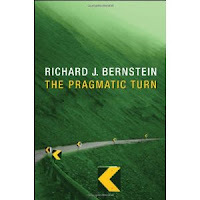 In this major new work, Richard J. Bernstein argues that many of the most important themes in philosophy during the past one hundred and fifty years are variations and developments of ideas that were prominent in the classical American pragmatists: Charles S. Peirce, William James, John Dewey and George H Mead. Bernstein develops an alternative reading of contemporary philosophy that brings out the persistence and continuity of pragmatic themes. He critically examines the work of leading contemporary philosophers who have been deeply influenced by pragmatism, including Hilary Putnam, Jürgen Habermas, Richard Rorty, and Robert Brandom, and he explains why the discussion of pragmatism is so alive, varied and widespread. "This book is not intended to be a history or survey of pragmatism. I have lived with the pragmatists for more than 50 years, and I want to share what I have learned from them. I believe that my original intuitions about the importance of pragmatism and the sea change it initiated have been fully vindicated. Today, all vigorous creative discussion of pragmatic themes by thinkers all over the world is more widespread than it has ever been in the past". "When I teach courses dealing with pragmatism (old and new), I tell my students that it is best to think of the discourse about pragmatism as an open-ended conversation with many loose ends and targents. I don't mean an "idealized" conversation or dialogue, so frequently described and praised by philosophers. Rather, it is a conversation more like the type that occurs at New York dinner parties where there are misunderstandings, speaking at cross-purposes, conflicts, and contradictions, with personalized voices stressing different points of view (and sometimes talking at the same time). It can seem chaotic, yet somehow the entire conversation is more vital and illuminating than any of the individual voices demanding to be heard. This is what the conversation of pragmatism has been like." Richard J. Bernstein is Vera List Professor of Philosophy at the New School for Social Research, New York. Papers on Dworkin's "Justice for Hedgehogs"
Papers from the symposium on Ronald Dworkin's forthcoming book "Justice for Hedgehogs", September 25-26, 2009, at Boston University School of Law. The book is coming out on Harvard University Press in October 2010. Videos from the symposium can be found here! For excerpts from Ronald Dworkin's forthcoming book, see my previous post. Martha Nussbaum is Professor of Law and Ethics at the University of Chicago. Professor Jeremy Waldron delivered the three-part Holmes Lecture series, the most prestigious talks at Harvard Law School, on October 5 through 7, 2009. See videos of Waldron's lectures here. Will John Rawls still be read in a century? 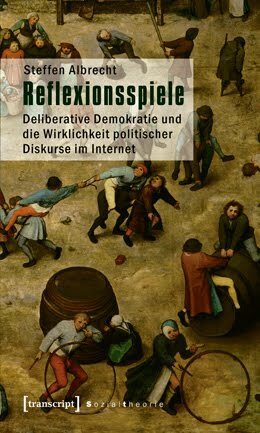 Jürgen Habermas' Modell der deliberativen Demokratie gilt als zentrales Paradigma der politischen Theorie. Die kommunikations-theoretischen Annahmen über Diskurse werden allerdings durch die zunehmend alltägliche Onlinekommunikation in Frage gestellt. Welche Strukturen der Partizipation entstehen in politischen Diskursen im Internet? Und welche Dynamik prägt die Diskussion? Diesen Fragen geht der Autor in einem empirischen Vergleich von neun Onlinediskursen nach. Die Ergebnisse der explorativen Studie führen zu einer Neubestimmung des Zusammenhangs von diskursiver Kommunikation und ihren Wirkungen, der als »Reflexionsspiel« gefasst und ausgearbeitet wird. Steffen Albrecht ist wissenschaftlicher Mitarbeiter am Medienzentrum der TU Dresden und Projektleiter für politische Kommunikation und Onlineforschung bei Zebralog (Berlin). A reception in memory of G. A. Cohen at the Philosophy Department, University College London. A memorial service at All Souls College, Oxford University. Myles Burnyeat, John Roemer, T. M. Scanlon, and Philippe Van Parijs will be speaking. Martha C. Nussbaum: "Liberty of Conscience"
"Religious Liberty: Sources and Constraints". "The Capability Approach on Social Order"
Martha Nussbaum is Professor of Law and Ethics at the University of Chicago. On May 26, 2010, Martha Nussbaum was honored with Harvard's Centennial Medal. 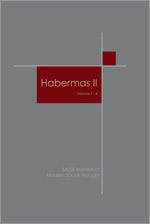 74 essays on Jürgen Habermas - "Habermas II"
A new four-volume set with secondary literature on Jürgen Habermas, written since 2000. The set is a supplement to "Habermas I" edited by David M. Rasmussen and James Swindal(Sage, 2002; 1664 pages). All articles and chapters have been reproduced exactly as they were first published. They have been selected on the basis not only of their clarity of presentation and argument, but also for the way they characterize a significant dimension of current Habermas scholarship.